CanadaVet.com Blog: What's the average dog and cat life span in the USA? 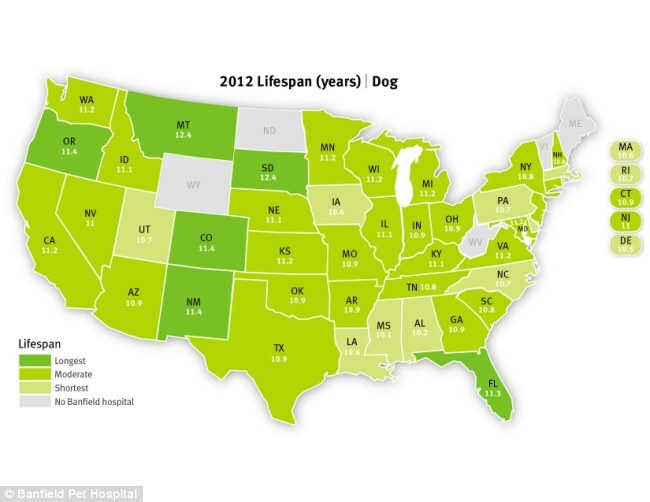 What's the average dog and cat life span in the USA? You might be surprised to hear it, but according to a recent study, the lifespan of an American dog or cat, depends on where you live. Regional health factors (such as heartworm disease, heat stroke and lyme disease) mean that pets live longer in the West, and have the shortest lifespans in Southern states. After regional factors the biggest factor in determining lifespan is whether your animal is spayed or neutered. 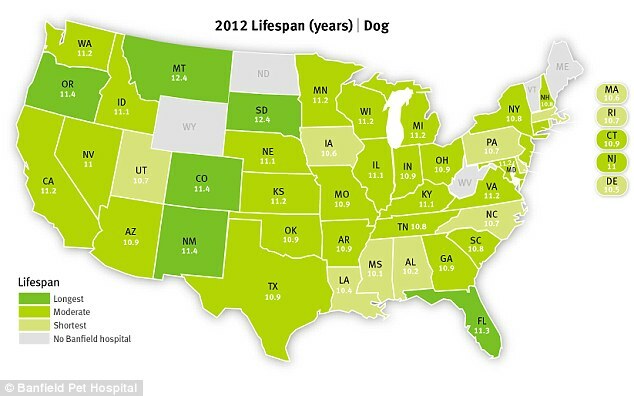 According to the study by Banfield Pet Hospital, on average, American dogs live longer in South Dakota, Montana, Oregon, New Mexico, and Colorado, and have shorter lifespans in Mississippi, Alabama, Louisiana, Delaware, and Massachusetts. American Cats live longer in Montana, Colorado, Rhode Island, Illinois, and Nebraska, and have shorter lifespans in Delaware, Ohio, Louisiana, Kentucky, and Mississippi. The study reports that 20 per cent of the cats in Louisiana and Mississippi, states with shorter life expectancy, are not spayed or neutered, but in Montana and Colorado, states with longer life expectancy, 8 per cent of cats are not spayed and neutered. The statistics also show that neutered male dogs live 18 per cent longer than unneutered male dogs, and spayed female dogs live 23 per cent longer than unspayed female dogs. Neutered male felines have a 62 per cent longer lifespan, and spayed female cats a 39 per cent longer lifespan. 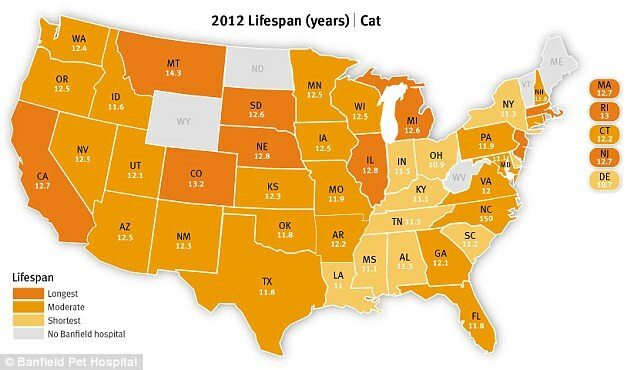 The map shows the states in which cats have the highest and lowest lifespans. In addition to just being susceptible to environmental factors unneutered pets living in the warmer Southern states are more susceptible to diseases because they spend more time outdoors. The research showed that neutering male pets decreases chances of prostate problems and eliminates the risk of testicular cancer. Spaying female pets lowers the chances of contracting breast cancer and eliminates the risk of pyometra, a potentially fatal uterus infection. Furthermore, unneutered dogs are more than twice likely as neutered dogs to get hit by a car or bitten by other animals. Unneutered cats are four times as likely as being hit by a moving vehicle. In general neutering and spaying pets decreases aggressive behavior including roaming, spraying to mark territory, and fighting.